Answers to common questions can be found in the sections below, or you can use the search box above to find information using specific keywords. If you have questions that are not covered here or if you have suggestions for topics not already covered, please contact us. How do I select and size a mixer? Choosing the right kind of mixer for your process can be a daunting task as there are so many variables to consider. Careful consideration of the end result required, the physics of the materials (rheology, temperature, etc. ), the process conditions (e.g., flowrate and pressure) and the economic constraints, all play a vital role. With over 20 years of experience in selecting and sizing suitable equipment for a wide range of process tasks, Maelstrom personnel are always happy to help. Backed by free trials to investigate materials or demonstrate performance, Maelstrom can ensure that you get the best possible solution for your needs. Contact us to discuss your application. What information do I need to select a mixer? Abrasiveness, toxicity, pH, flammability, etc. There may be other items of information required for more detailed specification of a particular machine, but the data above forms a sound basis for discussion. Can you help me select a mixer? Certainly. We appreciate that mixer selection can be a complex and daunting task that cannot be easily achieved using catalogue information alone. We would be happy to offer our experience to guide you through the selection process and help with trials, if necessary, to demonstrate performance in your specific application. Note that, in common with most suppliers of process equipment, we cannot warrant actual process performance in your application, e.g. that a specific droplet size or some other metric will be achieved. This means that the responsibility of selecting the correct mixer remains yours, although we will do our best to help with suggestions and trials. Why do you only offer inline equipment? 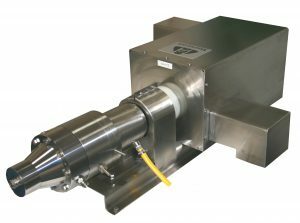 Greater flowrates are possible - up to hundreds of tonnes per hour on certain machines. What materials of construction do you use? Mixer “wetted parts” are typically made from 316 series stainless steel although many other materials are available, including Hastelloy® and titanium. Non-wetted parts may be made from stainless steel, painted structural steel, aluminium or other materials, depending on the mixer size and application. Polymers used for static seals include Viton, EPDM, nitrile as standard with Chemraz® and Kalrez® optional for special applications. Mechanical seal faces are selected to suit each application, although SiC/SiC and Carbon/Ceramic are commonly used. Does the mixer rotation direction matter? Usually, yes. Whilst some mixing head geometries appear symmetrical, the use of right-handed threads to secure rotor components and the positioning of inlet and outlet ports means that they should only be operated in the direction indicated on the motor or nameplate. Extruder-based machines such as the EMT and EFS will only pump material when operated in the correct direction. If a three-phase machine is started and found to be running the wrong way, the simplest solution is either to alter the direction using the controls or to swap any two of the three phase wires at the motor or drive end. Only suitably qualified electricians should perform such tasks. Do you offer food and pharmaceutical-grade machines and systems? Yes. All Maelstrom machines can be optimised for food or pharmaceutical use depending on the options fitted. Special hygienic design features such as covered threads, fully sealed support frames and sealed fasteners can be complimented by polished finishes and washdown motors. Machines can therefore meet the most stringent EHEDG and cGMP requirements. Drives and controls can also be supplied to meet FDA 21 CFR requirements, for pharmaceutical use. Do you supply hazardous area (ATEX or UL) machines? Yes. All machines in Maelstrom's range can be fitted with options for ATEX or UL-rated compatibility and can be supplied with full documentation and certification packages to satisfy the relevant requirements. Maelstrom has supplied many mixers and systems for use in solvent-based applications and the petrochemical industry. As the requirements for hazardous areas are specific to each application, Maelstrom will need to know the classification of the area into which the machine is to be fitted. This may not be the same as where the controls and drives are mounted. Are your machines certified for use in my country? Maelstrom mixers supplied within the European Union meet the requirements of the relevant directives and are CE marked. A Declaration of Conformity is supplied with each machine. Machines shipped outside the EU will be supplied to meet local requirements although, in certain circumstances for complex machines or systems, the customer may need to take responsibility for local conformity assessment and type approval. I need a special-purpose machine that is not in your standard range. Can you help? Our custom engineering capability includes the ability to design, build and, if necessary, even invent solutions to particular processing problems. We have successfully completed many projects of this kind since 1998 and are always keen to provide a confidential proposal for this kind of work. Can you modify or customise a standard machine to suit my particular needs? Certainly. Because we specialise in high performance mixing, our customers often need special machine customisations to suit their particular processes and materials. We pride ourselves on being able to engineer or integrate world-class technologies and components into any machine within our range. What is meant by "mixing"? The word “mixing” is used loosely to mean the combination of two or more materials or “phases” to form a so-called “material system”. With such a broad definition, many other terms are used to try to describe particular aspects of mixing, often based on a common understanding in the process industry of what kind of machine is used to generate a particular mixing effect. For instance, blending, homogenisation, dispersion and shearing are all used to indicate certain mixing effects even though strict physical definitions of these effects are not universally agreed. In fluid mixing, components of a material system may be miscible (easily mixed) or immiscible (difficult or impossible to mix). In miscible systems, diffusion is the primary means of co-mingling the separate phases, whereas for immiscible systems, mixing energy must be added to overcome the repulsive forces between droplets and particles of one phase relative to the other. In practice, for most material systems, a combination of these effects is required to achieve the typical goals of uniformity and stability. It is worth noting that mixing is involved in many other important physical processes such as fluid structuring and reaction kinetics. Not surprisingly, mixing of some kind is at the heart of most industrial processes involving fluids. We use the term “dispersion” to refer to the type of mixing process involving in particle or droplet size reduction, almost always in immiscible systems or where a powder is being added to a liquid. In general, degree of dispersion is a function of the mixing energy input into a system by applying stresses to the materials, i.e. the higher the energy, the finer the dispersion. For liquid-liquid or solid-liquid systems, there are many and varied ways of applying disperse mixing energy although each method has a limited range of application and tends to have both advantages and disadvantages. Energy input can be readily compared between methods in kJ/kg but the way in which the material is stressed and relaxed is also critical and is much more dependent on the particular material system being processed. The exact mechanisms of stress application in most dispersive mixers are poorly understood and the complexities of the modelling problem are beyond even the most powerful of today’s computational fluid dynamics models. This means that physical trials are needed for most dispersion applications. Examples of dispersive mixer can be found in the kitchen. The food processor or “bar blender” are typical examples of machines that provide some level of dispersion, used for making emulsions such as mayonnaise, for whipping cream and for reducing the size of solid ingredients in sauces and pastes. The term “distribution” is generally used to describe a geometrical re-ordering phenomenon that results in blending of two or more materials. Distributive mixing performance is more related to the geometry of a particular mixer with respect to the volume of material being processed and its rheological behaviour than to the amount of mixing energy put into the system. Distribution is probably the type of mixing with which we are most familiar in daily life, from stirring a cup of coffee to mixing a paint colour or preparing concrete. Why is it so important to make small droplets or particles? For many applications, the smaller the particle or droplet, the better the final product in terms of quality and stability. Smaller droplets of one phase within another or particles within a liquid matrix normally gives improved stability and shelf-life, improved product “feel” (texture or mouth feel in foods, or absorption into skin for lotions, for example) and other specialised effects, such as transparency for certain nano-emulsions and nano-dispersions. In addition, smaller particles or droplets means increased surface area of contact between the two (or more) phases. This can effect reaction rates between phases, degree of reaction completion and degree of bonding. It is these effects that are generally the most important when we reach the nano-scale so that the true benefits of nanotechnology can be realised. What is meant by "emulsification"? An emulsion is a mixture of two or more immiscible fluids (phases) and is an inherently unstable material system. Emulsification is the process of mixing the phases together and improving stability by reducing the droplet size of the dispersed phase relative to the continuous phase. This typically requires a combination of high dispersive energy from mixing equipment and a suitable chemical emulsifying agent which helps to reduce the surface energy of the droplets to improve the compatibility of the two phases. Generally, the smaller the droplet size, the more stable and useful an emulsion is. Emulsions are typically white in colour but can become transparent if the dispersed phase is small enough and the continuous phase is clear. Most common emulsions use an oily (or lipid) phase and an aqueous phase. They can be creams and pastes, e.g. face cream and machine grease, or low viscosity liquids such as milk. Possibly 20% of dispersive mixing applications are in the field of emulsification. What do you mean by "viscosity" and "rheology"? The “viscosity” of a substance is a measure of its resistance to flow when a stress is applied. “Rheology” is the study of the flow behaviour of substances, including changes in viscosity, based on their physical composition and response to applied stresses. It particularly relates to complex materials such as muds, crosslinked polymers and certain biological fluids. Common materials exhibiting interesting rheological behaviour include ketchup (syneresis), cornflour starch/water (thixotropy) and rubber (visco-elasticity). For many dispersive mixing processes, shear-thinning and, more unusually, shear thickening are important considerations. These effects relate to the viscosity response of a fluid to applied shear stresses which are common to many types of dispersive mixers. What is the difference between batch and inline (continuous) fluid mixing? A batch is a discrete volume of material, normally contained and mixed within a vessel. Batch mixers are devices which can be lowered into the vessel from above or protrude into the vessel from below. Inline or continuous mixing is performed by piping the fluid into and out of an inline mixing device. In practice, an inline mixer can be used in three ways: as a true inline, single-pass device; as an inline, multi-pass device (by passing the fluid forwards and backwards through the mixer with a combination of pipes and valves), and as a batch recirculating mixer. 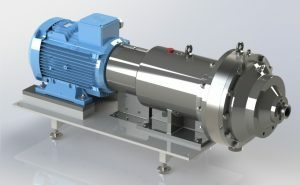 Inline mixers sometimes need a pump upstream of the mixer to drive material through them whereas a batch mixer must self-pump, i.e. be able to push material through its mixing head by itself. 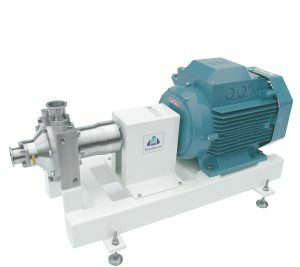 This can be a major limitation for batch mixers, as they mostly employ centrifugal-type pumping which is ineffective at higher viscosities. Can you use an inline mixer to recirculate a batch volume? Yes. By piping the outlet of a holding vessel to the inlet of an inline mixer and the outlet of the mixer back to the vessel, fluid will be mixed and recirculated in a similar way to a batch mixer. However, the lack of good distributive mixing in the vessel may lead to incomplete mixing of the batch, so it is common to include a simple impeller in the vessel as an additional device to provide bulk circulation. Can you explain "powder dispersion"? although these are normally just grouped into the one term. For high volume, rapid powder dispersion it is desirable to separate each powder particle and envelop it in liquid as fast as possible. This allows faster dissolution or stabilisation to occur, for a more efficient process. Larger or higher energy mixers than might be expected are often used for this reason and they can be in either batch or inline form. 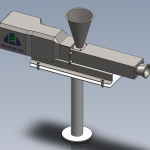 Inline mixers use eductors to feed the powder from a hopper into the fluid stream upstream of a high shear mixer which then does the wetting out and dispersion. One important factor in powder dispersion is the inclusion of air which can be detrimental in certain products such as foods and pharmaceuticals for reasons of increased bacterial growth. The powder itself contains a significant amount of air and this is carried into the fluid unless care is taken to remove it, using vacuum, prior to addition. Vacuum can also be used on a batch vessel following dispersion to remove entrained air. The EMT from Maelstrom provides a way of introducing powder into a dispersion with minimal air entrainment. How do I get rid of lumps or "fisheyes" in my powder dispersion? Certain types of powder dispersions are problematic because they form lumps, also called “fisheyes”, if they are not dispersed quickly. Materials that exhibit this behaviour include many common food and pharmaceutical “hydrocolloid” ingredients such as starch powders, gums, pectin, caseinates, alginates and methylcellulose. If the powder particles are not separated rapidly during the wetting phase of the dispersion, then the outer particles in a clump of material tend to hydrate so that a skin is formed over the clump. This skin is relatively strong and elastic and makes it hard to break the clump down for wetting of the interior particles, resulting in the typical “fisheye”. The answer is rapid and complete wetting out at the point of powder addition using a correctly-sized and operated high shear mixer. The individual particles are therefore separated rapidly and can wet out independently of each other to achieve complete hydration, swelling and gelling over time. How do I mix without aerating the product? This depends on the type of product being mixed. In general, inline mixing is better than batch mixing for reducing air entrainment as the mixer is normally fully flooded in operation. If a mixture must be prepared in a batch vessel, then inline device can be used in recirculation mode. If powders are to be added, then inline operation is more challenging, as standard rapid eduction and suction methods entrain a great deal of air directly into the mixture. 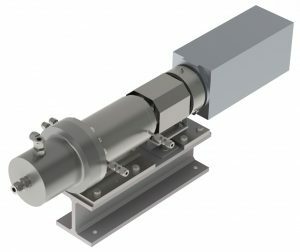 Vacuum must be used to remove air from the batch post-mixing in critical applications, but this can be expensive and time-consuming. Maelstrom has developed its EMT machine as a solution to this problem, allowing users to add large quantities of powders into fluid mixtures up to high viscosities. Note that in making droplets and particles as small as possible using dispersive mixers, air bubble sizes are also reduced. This makes de-aeration more problematic in the post-mixing phase so it is better to avoid including air in the first place, if possible. 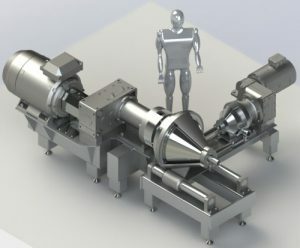 How small can I make my particles using fluid mixers and mills? 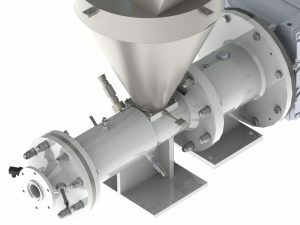 A fluid “mill” is a common term for a type of mixer that is used to reduce the size of solid particles in a liquid. Some kinds of mixer can be used as mills but other mills are specially designed just for this purpose, for example media mills that tumble beads of hard ceramic material in the mixture to break particles apart. the stress than can be applied by the mill. It is important to note that in fluid mixing, reduction in fundamental size of a particle is not normally achievable for a typical hard material. This is because the fluid “protects” each particle from the applied stresses so that its yield stress is seldom exceeded. A more common ambition is to deagglomerate and/or deaggregate the typical clumps of fundamental particles found in a suspension and then stabilise them at the smallest size possible. Researchers have reported sizes in the region of 50nm but it becomes exponentially harder to achieve much smaller sizes than this due to increased inter-particulate London forces. Maelstrom milling technology can deliver results down to this level with reduced contamination and lower running costs than competitive technologies. Do you offer trials using customer materials? Normally, yes. Maelstrom has a dedicated laboratory and trial facility equipped with a range of inline mixers and ancillary equipment such as pumps. Low to medium-complexity trials can be performed with non-hazardous and non-toxic materials only. In some cases, it is possible to bring equipment to customers' sites for trials, although this is not commonly done. Simple trials taking less than one day to complete are normally provided free of charge. Longer or more complex trials may be charged for, although a rebate of a proportion of these charges can be given against a purchase. Terms and conditions apply. Certain mixers in the range are available for hire, subject to availability, for periods of up to a month. There are some restrictions including not using on toxic, difficult to clean materials etc. We also ask that customers take responsibility for the machines and underwrite them for damage, repair and cleaning. Please contact us to obtain a hire quotation and confirm machine availability. Is there a distributor or agent in my country? We currently service all enquiries from our UK base near Manchester. The wide variety of machine types and options to meet specific customer requirements makes this the most effective and reliable way to ensure that customers get the best solutions. As our manufacturing, final assembly and testing is all performed locally in the UK, we can also keep close control over quality and customer confidentiality. This is a critical requirement for some of our larger customers. Would you offer a process warranty for my application? No. We do not warrant the performance of any machine in a given application because we cannot be certain that the machine is being used correctly, that the materials are behaving in exactly the way originally specified and that the results can be clearly and accurately measured. Instead, we support customers in their decision-making process about which equipment to purchase and we offer scale trials to give confidence that the equipment will meet their expectations in service. Our high levels of customer satisfaction and repeat business reflect the efforts we go to in ensuring that each Maelstrom machine works the way the customer expects. What are your typical delivery times? Machines are normally made to order and this usually takes 6-8 weeks for small machines and 8-10 weeks for larger ones. More complex machines and systems may take 12-16 weeks, depending on the degree of complexity and custom design effort involved. All machines are tested on water or other suitable test fluid before shipping, where this is possible. This typically takes 2-3 days and is included in the times given above. What certification comes with each machine or system? For machines supplied within the European Union, an EC Declaration of Conformity is provided, signed by a Maelstrom director. For machines that cannot be operated independently and are intended for incorporation into a larger system, a Declaration of Incorporation will be provided instead. Machines supplied to export markets will have a signed declaration or other certification as mandated by local regulations, by agreement with the customer. If a customer requires mill certificates or other, specialist documentation, then this must be made clear at the time of ordering. An additional charge may be made for such documentation. What warranty comes with each machine or system? Every machine and system supplied by Maelstrom carries a 12 month full parts and labour warranty against mechanical and electrical defects subject to fair wear and tear and damage caused by the customer. No process warranty is supplied, i.e. Maelstrom does not warrant that a machine will perform as the customer requires in their particular application. Customers must be satisfied prior to purchase that the machine is suited to their needs. Maelstrom will also not accept liability for consequential damages in the event of a machine failure and its liability is limited to the value of the machine in all cases. For smaller machines, payment is required in advance. For large machines, special customisation and complex projects, we would normally establish a credit account for customers with some payment at the start of the project and then stage payments based on delivery progress. Where are Maelstrom's machines manufactured? All of Maelstrom's machines and systems are designed, built, assembled and tested in the UK. Machining operations take place in the North-West of England and assembly and testing is usually performed in Maelstrom's own factory. Certain machine components such as bearings, seals, motors, controls etc. are sourced from quality suppliers around the world and carry all relevant certifications and approvals. Customers can also specify that particular manufacturers are used for such components, to fit their maintenance and spares programmes.